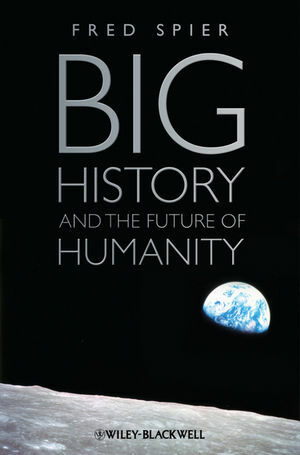 Big History and the Future of Humanity presents an original theoretical approach that makes “big history” – the placing of the human past within the history of life, the Earth, and the Universe -- accessible to general readers while revealing insights into what the future may hold for humanity. Fred Spier is Senior Lecturer in Big History at the University of Amsterdam and also teaches Big History at the Eindhoven University of Technology. He is the author of Religious Regimes in Peru (1994), San Nicolás de Zurite (1995), and The Structure of Big History: From the Big Bang until Today (1996). Chapter One: Introduction to Big History. A Very Short History of Academic History. A Short History of Big History. A Historical Theory of Everything? Energy Flows and the Emergence of Complexity. Chapter Three: Cosmic Evolution: The Emergence of Simple Forms of Complexity. The Big Bang: No Complexity. Recent Issues Concerning the Big Bang Scenario. The Radiation Era: The Emergence of Complexity at the Smallest Scales. The Matter Era: The Emergence of Complexity at Atomic and Molecular Scales. Galaxy Formation: The Emergence of Complexity at Larger Scales. Chapter Four: Our Cosmic Neighborhood: The Emergence of Greater Complexity. The Emergence of Our Cosmic Neighborhood. The Solar System Habitable Zone. Chapter Five: Life on Earth: The Widening Range of Complexity. Planetary Energy Flows and Life. The Emergence of Energy Harvesting from Outside. The Emergence of the Biological Food Web. The Emergence of Multicellular Organisms. The Emergence of Brains and Consciousness. The Increase and Expansion of Biological Complexity. Chapter Six: Early Human History: The Emergence of the Greatest Known Complexity. The Emergence of Early Humans. Tool Making and Brain Growth. The Rise of Modern Humans. Chapter Seven: Recent Human History: The Development of the Greatest Known Complexity. Social Effects of the Agrarian Revolution. The Emergence of Agrarian Religions. Increasing Agricultural Complexity and Declining Untamed Complexity. The Emergence of Big States. The Emergence of Moral Religions. Energy and Complexity in State Societies. The First Wave of Globalization. Industrialization: The Second Wave of Globalization. Informatization: The Third Wave of Globalization. Energy, Complexity and Goldilocks Circumstances. Chapter Eight: Facing the Future. A Very Short Overview of the Long Future of the Universe. The Future of Earth and Life. The Availability of Matter and Energy. Exhaustion of Critical Resources and Growing Entropy. Will Humans Migrate to Other Planets? Appendix A: Short Time Line of Big History.